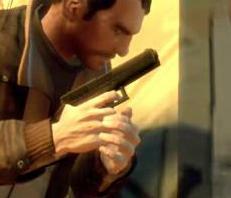 Niko Bellic weilding the Pistol in Grand Theft Auto IV. 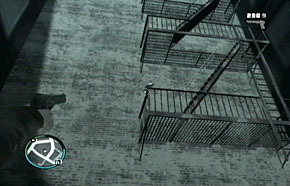 The player aiming with a pistol in Grand Theft Auto IV. The pistol is the most basic firearm in many Grand Theft Auto games. The pistol is mainly used at the start of the game, or later when the player has run out of ammunition for better firearms. In its original form in GTA 1 and GTA 2, the pistol is one of the least effective firearms of them all, firing only one bullet every second or so, at a rate slower than a machine gun. From Grand Theft Auto III onwards, the pistol is given generally poor stopping power, average accuracy, and a fairly short range. In Grand Theft Auto: San Andreas, Grand Theft Auto IV, Episodes From Liberty City, and Grand Theft Auto V, the weapon is significantly more effective, partly because it's possible to kill a target in one shot to the head; also, in GTA IV, EFLC, and GTA V, the pistol can be used as a drive-by weapon. In every game since GTA III, this weapon is the standard armament of many gang members and all police officers on patrol. In GTA 1 the pistol's HUD image appears to be a Soviet Tokarev TT-33. In GTA London 1969, the pistol's HUD image resembles a nickel-plated Browning Hi-Power. At the time of GTA London (1969), the Hi-Power would've been one of the main service pistols of the British Army. As such, this makes the availability of the pistol in the game chronologically accurate. In GTA III, GTA Vice City and GTA San Andreas, the pistol resembles a Colt M1911 in shape, and its magazine capacity ranges from 12 rounds (in GTA III) to 17 rounds (GTA Vice City onwards). All of this is despite the fact that the Colt M1911 isn't commonly chambered in 9mm and, even if it was, it still possesses a single-stack magazine design, therefore making it impossible to fit 17 rounds into the magazine without completely redesigning the weapon. It is seen carried by Ray Machowski in the mission "Crazy 69" of GTA Liberty City Stories, but is not available to use in-game. In the introduction cutscene of GTA San Andreas, where all three members of C.R.A.S.H. arrest Carl Johnson; Jimmy Hernandez and Eddie Pulaski are holding Glock 17s, instead of Colt M1911s like the ones in gameplay. Given the fact that the in-game pistol's magazine capacity (17 rounds) is incorrect for a Colt M1911 but correct for a Glock 17, and the fact that the Glock really is a 9mm pistol, it may be that the developers originally intended the player to use the model seen in the cutscenes, but this feature was left out for some reason. The Glock 17 can be used in-game by switching and swapping the pistol's model/texture with the Glock's one. In GTA Liberty City Stories, the pistol resembles the Glock 17, while in GTA Vice City Stories, the pistol resembles a Beretta 92. In GTA IV and EFLC, the pistol resembles a Glock 22, which is the full-size .40 S&W model commonly used by law enforcement. While the real-life Glock 22 has a standard 15-round magazine capacity, the in-game model incorrectly has the 17-round magazine capacity of the 9mm Glock 17. The sights on the model are incorrect; the gun's front sight is a duplicate of the twin-post rear sight. In GTA Chinatown Wars, the pistol's HUD icon suggests it's a Glock 17 with wooden grips. In GTA V, the pistol resembles a Taurus PT92, distinguishable from the similar Beretta 92FS by its frame-mounted safety (the safety on the Beretta is on the slide). The real-life PT92 uses a 17-round magazine, yet the in-game version is limited to 12 rounds for the standard magazine or 16 rounds with the extended magazine. Also, the in-game description incorrectly describes the Pistol as a .45 caliber handgun whereas the PT92 is chambered in 9mm. In many of the games in the series, variants of the entry-level pistol exist. In GTA San Andreas, for instance, the player can acquire the ability to wield two pistols at once, and there is a modified pistol with a sound suppressor. In addition, most of the games in the series have at least one more powerful, larger-caliber equivalent of the pistol, such as the Python or the Desert Eagle. If in the hands of a skilled shooter, the pistol can be very effective given its weak power, decent accuracy, & mid range distance. The Pistol in most of the Grand Theft Auto III-era games. Resembles the Colt M1911 pistol. The Glock that is used in GTA San Andreas' cutscenes. GTA Liberty City Stories also uses this. A Pistol in Grand Theft Auto: San Andreas. The Pistol in Grand Theft Auto: Liberty City Stories. It best resembles a Glock. The Pistol in Grand Theft Auto: Vice City Stories. Resembles a Beretta 92 or "M9" pistol. The Pistol in Grand Theft Auto IV. Also closely resembles a Glock. The Pistol in Grand Theft Auto V. It resembles a Taurus PT92. GTA London 1969 and GTA London 1961. The Tokarev TT-33 in real life seen in GTA 1. The Browning Hi-Power in real life seen in GTA London. The Colt M1911 in real life featured in Grand Theft Auto III, Grand Theft Auto Vice City, and Grand Theft Auto: San Andreas. The Glock 17 in real life seen in Grand Theft Auto: Liberty City Stories and Grand Theft Auto: Chinatown Wars. The Beretta 92 in real life exclusive to Grand Theft Auto: Vice City Stories. The Glock 22 featured in the GTA IV Era. Red Light District, Portland - Available to buy from Ammu-Nation for $250 after completion of Pump-Action Pimp ($4,000). Callahan Point, Portland - On the north ledge of the large building next to and south of the Callahan Bridge. Vice Point - On the first floor of the main building under construction at Fairground Point (in Avery's Buliding). North Point Mall - Available to buy from Ammu-Nation from start of game ($100). Ocean Beach - Available to buy from Ammu-Nation from start of game ($100). Ganton, Los Santos - Corner of wall behind a house across from the Johnson House in Grove Street. Las Colinas, Los Santos - Beside a wall in an opening between two houses. Garcia, San Fierro - Corner of a narrow alleyway. Tierra Robada, Las Venturas - Under stone support beam for the railroad track. Roca Escalante, Las Venturas - Inside the police station, where a shotgun, body armor and nightstick also spawn. The player incurs an instant 2 star wanted level after picking up this pistol. Available to buy from Ammu-Nation after completion of "Doberman". Willowfield, Los Santos - In Emmet's after the mission "Nines and AKs". Available for purchase from Stonewall J's, Little Havana. Available for purchase from Ammu-Nation, Downtown. The Glock (referenced as Pistol in-game) can be purchased from the back-alley gun shops for $600, and each additional magazine is $35. The Glock can be purchased from Little Jacob for $420, and each additional magazine costs $25. Firefly Island - Can be found to the right of the "Liberty Go-Karts" wall mural to the right of Wappinger Ave.
East Hook - Can be found on the first-floor ledge of a cylindrical silo-type structure off Mohanet Ave. The player can easily reach it with an SUV/MPV or other tall vehicle like a Cavalcade or Ambulance. Willis - Can be found behind and to the left of the parking lot off Freetown Ave. This parking lot is also located to the left of the small parking space where you obtain Stevie's Comet during the mission No. 1. Liberty - Can be found on a giant rock in the West River just east of Westdyke, Alderney. You can see the rock from the Hickey Bridge as well. Northern Gardens - Can be found in the ladies' powder room of the Triangle Club. Please note: this pistol should be obtained only as a last resort, because otherwise the player shall receive a one star wanted level and the patrons and guards will begin shooting. Middle Park - Can be found on the lone island in the lake, next to the tree growing there. The Meat Quarter - Can be found on the West River side of the driving range of the Golden Pier Golf Club, next to a sand trap. Westdyke - Can be found on the roof of the ancient casino featured in the mission Out of Commission. Westdyke - Can be found on the roof of the garden shed of a mansion on Owl Creek Ave. The mansion is the same one where the Turismo is parked out front for Stevie's car thefts. Berchem - Can be found in the alley behind the TW@ Internet Café, atop a small garage roof. It can be purchased from the Ammu-Nation website for $200, or $100 with the discount acquired. Can be purchased at Ammu-Nation in Los Santos and Blaine County. Found in Richman on the bleachers at the University Track and Field. Can be found in Joshua Road, Harmony on a back porch of a burned down house. Found at Paleto Forest next to a roadside drain. Found in Richman Glen behind the gas station. Found in La Puerta on a wheel cover inside the junkyard bus. Found in Pacific Bluffs in an open grave. Found in Rancho at a power station relay. Found in the Grand Senora Desert beside a radio station dumpster. Found in La Mesa on a train yard storage tank near a skateboard park under the freeway. This page was last modified on 30 March 2014, at 07:59.